Recycling reduces the demand for raw materials, lessening the impact of extraction and transportation. It is estimated that for every tonne of waste thrown away, an extra 20 tonnes of waste is created at the point where the raw material is extracted. Substantial energy savings can be made by using waste materials rather than raw materials, ranging from a potential 22% energy saving for recycled glass to a potential 97% saving for recycled polythene. There will be no demand for waste materials for recycling unless there is a demand for them to be turned into another product, and if people buy that product. Recycled products today can be made to the same standards as products made from raw materials. Many products do not even state their recycled content as this might be considered a sign of inferiority. For instance, recycled paper is now available at similar standards to high quality virgin paper and will function perfectly in printers and photocopiers. Significant proportions of household waste can be brought to local recycling banks and civic amenity sites. In kerbside collection schemes, special containers are left with each household alongside the normal bin bag or wheeled bin, for the householder to fill with clean, sorted materials for recycling, such as glass, aluminium and plastic. 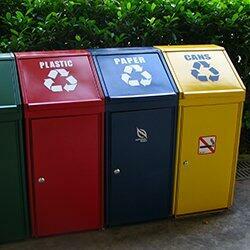 Local councils are responsible for providing facilities for the recycling of household waste. They operate the recycling banks and civic amenity sites where different types of waste can be taken for recycling. Most local councils have facilities for recycling newspapers and magazines, aluminium cans, glass and textiles. They are also responsible for setting up kerbside collection schemes. Bottle banks are found in many local council areas and are divided into those accepting clear, green and brown glass. Blue glass can be put into the green bank, and clear glass with coloured coatings can be put into the clear bank as the coating will burn off. The labels on bottles and jars will be removed during the recycling process, however remove as many plastic or metal rings and tops as possible. Only recycle bottles and jars – never light-bulbs, sheet glass or Pyrex type dishes as these are made from a different type of glass. Most local authorities have recycling banks for newspapers and magazines, as this is the most abundant type of paper in household waste. Make sure that you don’t put other types of paper in, such as cardboard or junk mail, as this will contaminate the load and the reprocessors will not accept it. Some local authorities may have separate banks for these. Packaging such as milk and juice cartons cannot be recycled as paper as they have a plastic lining which would contaminate the process. Many local authorities have mixed can banks accepting both aluminium and steel cans, although some have aluminium only banks as uncontaminated aluminium has a higher value. Aluminium can be recognised by the fact that it does not stick to a magnet, has a very shiny silver base and is very light in weight. Steel cans are also called “tins” as they contain a very thin layer of tin. Try to crush drinks cans before recycling, either with a can crusher or by squashing them underfoot. Aerosol cans made from steel or aluminium can be recycled in Save-a-can banks (check the front of the banks for guidance), but they must be empty and should not be crushed. Charities run textiles banks for unwanted clothing, which are then sold in charity shops, given to the homeless or sent abroad. Even damaged or unwearable clothing can be converted into items such as wiping cloths, shredded for use as filling for items such as furniture or car insulation, or rewoven into new yarn or fabric. To deposit shoes, tie them together as they tend to go astray! Plastic is a difficult material to recycle as there are many different types of plastic (often indicated by a number, or letters such as PP, PET or PVC). The variation in plastic means that different reprocessing techniques are required. The different types of plastic therefore need to be collected separately, or sorted after collection, as reprocessors will specify which type of plastic they will accept. Plastic in household waste is often food packaging and therefore too contaminated to be recycled effectively. Plastic is a light, bulky part of household waste, and therefore it is difficult for councils to store and transport sufficient quantities of plastic to make recycling economically viable. Many councils have found it to be too expensive and do not have facilities for plastic at all, while others recycle only plastic bottles which are worth more money. If your council does recycle plastic, make sure that you are recycling the right type of plastic, and always remove the tops of plastic containers so that they can be crushed. Organic household waste is food and garden waste. Organic waste is a problem if sent to landfill, because it is impossible to separate out from other waste once mingled, and will rot, producing methane, a greenhouse gas responsible for global warming. The best use of organic waste is to either compost it through a centralised composting scheme run by your council, or to compost it at home. Find out if your council has facilities for taking garden waste for composting. Alternatively, build or invest in a home composter for the garden, or try a worm bin for indoor use! There are very few facilities for recycling household electrical or electronic waste. There is a scheme for recycling certain types of mobile phone. There are a number of schemes for repairing and recycling goods such as refrigerators and washing machines which can then be passed on to low income households. Check with your council to see if they have facilities for household appliances, electronic equipment, or CFC extraction for old refrigerators. Batteries are varied and complex, come in different shapes and types, and are consequently very difficult to sort and recycle. The toxic materials have now been removed from ordinary batteries and they are safe to dispose of with your normal household waste. Rechargeable batteries, or nickel cadmium batteries, do still contain hazardous metals and should be returned to the manufacturer where possible. A few local authorities provide facilities for recycling these, as well as lead acid car batteries, which may also be returned to garages. If you use rechargeable batteries, look out for the new versions containing no mercury or cadmium. Contact charity organisations who take unwanted household furniture and items, and pass it onto community groups, low income families and other groups in need. Household hazardous waste such as paint, solvents and garden chemicals comes under the jurisdiction of your local council. Take them to a civic amenity site if facilities exist, or contact your council. Some councils also provide facilities for de-gassing fridges and for recycling fluorescent tubes. Packaging is often made up of a mixture of materials, such as ‘tetra paks’ which can be made up of paper, plastic and metal, making recycling difficult. There is a lack of facilities and technology for recycling mixed packaging, meaning that the materials are difficult to separate out without contamination. Packaging is a very visible form of waste, making up around one third of the average household dustbin. Packaging is often necessary to protect the product, to prolong its lifespan and to provide essential information. However, over-packaging does occur, especially for marketing purposes. Basic foods such as bread and rice are rarely overpackaged, while convenience foods often have two or three layers of packaging. Try to avoid overpackaging where possible, and when choosing a product, pick the packaging material which is easiest for you to recycle locally.